town attendees, uses the Vancouver Convention Centre, and at least three downtown convention hotels. The strong showing in 2018 is in part driven by an influx of nature and sustainability-themed conferences taking place at the award-winning Vancouver Convention Centre, the world’s first double LEED Platinum convention centre. Vancouver will welcome GLOBE in March (estimated 3,900 out-of-town attendees and 10,000 total), Sustainable Brands in June (estimated 2,000 out-of-town/total attendees), the American Society of Animal Science in July (estimated 4,500 out-of-town attendees and 5,000 total), the International Ornithological Congress in August (estimated 1,800 out-of-town /total attendee), and the Entomological Society of America in November (estimated 2,000 out-of-town/total attendees). Among the citywide events are the 2018 Canadian Tire National Skating Championships which just wrapped up in January (3,500 out-of-town attendees), HSBC Canada Sevens - World Rugby Sevens Series at BC Place in March (3,230 out-of-town attendees), and the internationally recognized BMO Vancouver Marathon in May (5,000 out-of-town attendees). 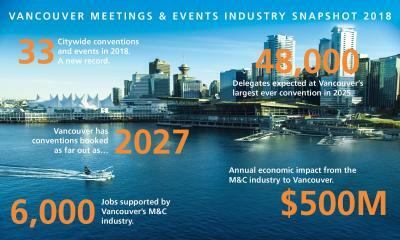 Vancouver is currently booking conventions as far away as 2027, and beyond. To view the full list upcoming citywide conventions, visit www.tourismvancouver.com/meetings/citywide-meetings/.